March | 2017 | Fly Me To Mayon! Legazpi is one of Philippine’s most visited cities by local and foreign tourists today. The amazing beaches, the majestic Mt. 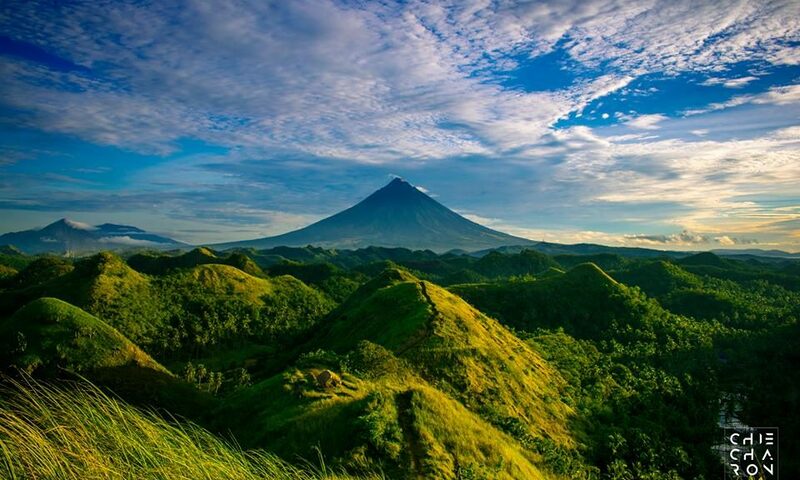 Mayon, the many stone churches in and around Albay, and other scenic places to visit (not to mention the many festivals year round) makes Legazpi a tourist favorite. An aerial view of the city. It is beautiful and captivating with the miles and miles of shoreline framed by the majestic Mayon in its rear. What a sight to behold! But do you know that this city is much easier to visit than ever before? Both the increased number of flights from Manila and Cebu and the many bus lines that have Legazpi as one of its key destinations in South Luzon makes it very possible and affordable to enjoy the natural beauty of this city. There are many hotels in town, many of which have just the perfect location for either a quick spin around popular local destinations or a long-term exploration of the Sorsogon-Albay-Catanduanes provinces. 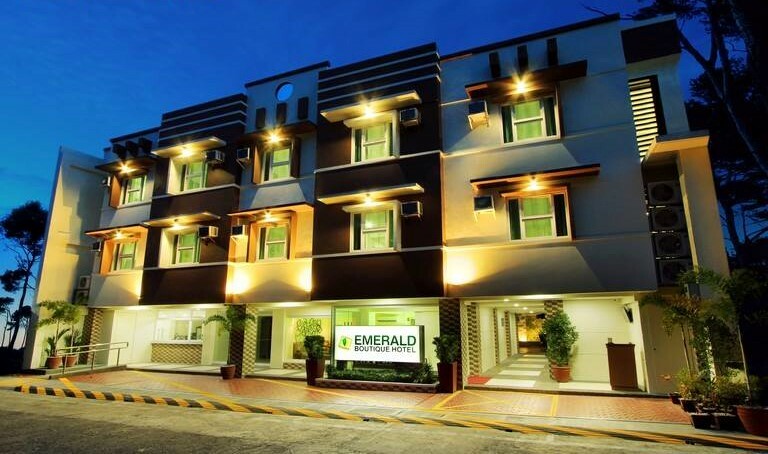 One of the newest hotels in Legazpi – the Emerald Boutique Hotel. It might be small compared to some of its competitors but this hotel aims to go above and beyond their guest’s expectations. Book with them and experience the difference. Legazpi sits right in the middle of the tourism frenzy so it does not matter what you are after, you will surely get it here. Aside from hotels there are also small bed and breakfast businesses and mid-sized Inns in the city. Hotel rooms can cost you P6000 and up if you are into luxury accommodations. But you can also have a decent place to sleep for as low as P500 a night, a must-have option for the more frugal traveler. There are many tour operators in town. If you are into guided tours there are several local companies that can cater to that need, some can even get you halfway to Mayon’s crater (if the ban is lifted anyway). Do you want more daring adventures? Perhaps an ATV ride all the way to the foot of Mayon, or zip-lining over the water at Embarcadero? That can be arranged too. 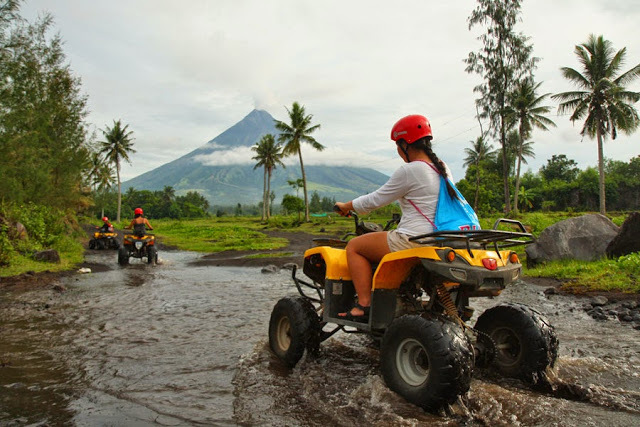 Riding the ATV to the foot of Mayon is loads of fun. You should try it! How about navigating a hanging bridge on the side of Lignon Hill with Mayon as the background? You can even have a swim with butandings (whale shark) at Donsol. If you love the ocean then the vanishing island in Malilipot is the ideal kind of adventure for you. All these attractions and activities can be had easily with local tourism service operators. How to get to Legazpi? There are many flights to Legazpi from Manila and vice versa. You will have no problem going in and out of the city by air. There is a 4:55 AM early flight from Manila to Legazpi. The same plane would fly passengers to Manila for its turnaround flight. 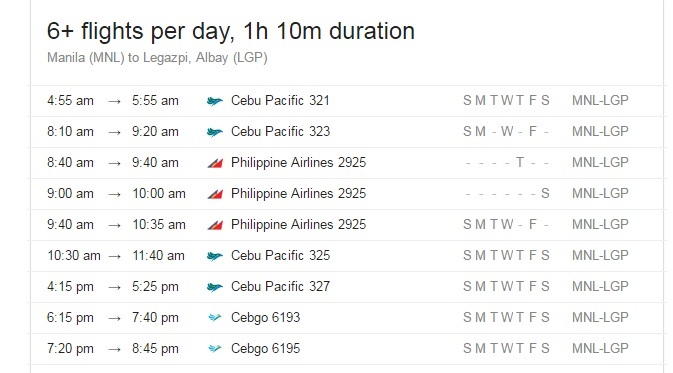 There is also a daily flight from Cebu to Legazpi at 3:25PM. With Manila and Cebu welcoming flights from all over the world and the Philippines, flying to Legazpi is easy and thanks to budget airlines – affordable! The flight schedules for Manila to Legazpi. This should make your flights plans easier! Travelling by Bus to Legazpi is more convenient than many people think. There are many bus companies that focus on the Bicol market, coming up with services that improve the travel experience of Bicolanos who frequent Manila. This consequently allows for the overall improvement of the by-land travel of tourists from Manila to Legazpi and vice-versa. 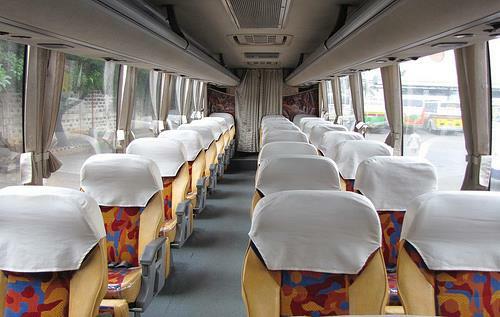 Cagsawa’s Royal Class Bus. This boasts very generous legroom with seats that recline almost completely allowing passengers to sleep through the Manila-Legazpi trip. Two of the leading bus lines serving the Manila-Legazpi route are Cagsawa and Penafrancia. They have multiple trips all throughout the day. The most convenient of all are the night trips that depart from Manila at around 7:00 PM. These buses have a very spacious leg room with recliner seats and foot rests that will allow you to sleep thought the 12-hour trip to Legazpi. The same bus departs from Legazpi to Manila at around the same time. Bus fares differ from one bus lines to the next but with the quality of your trip at stake, go for the more expensive and convenient trip available.